I get grumpy when I get sick; just plain grumpy. I tend to be irritated at everyone and everything. Needless to say, I’m not much fun to be around. With that being said, I was in a grumpy mood this morning as I rummaged through our medicine cabinet looking for cold medicine when I pulled this acid reducer from the back. I stood there for a minute, staring at it as if I had never seen it before. But, the thing is, I had. I knew this exact box all too well, although it had been over a year since I needed it. You see, towards the end of my drinking I started suffering severe stomach problems. It was also during this time I started the age-old alcoholic “trick” of switching my choice of drink. I’d been a wine drinker for many years, so maybe if I switched to beer the problem would go away. Or, maybe if I alternated between beer and hard alcohol, my stomach would get back to “normal.” Of course, I never EVER considered just quitting! None of that seemed to work, so I immediately went to worst case scenarios. My mom had died of pancreatic cancer so maybe it was that; or maybe I had an untreated ulcer; or what if it was my liver? I mean, could my drinking be “that” bad where it could be effecting my body? I was never completely honest with my doctor about my drinking, so she had no way of knowing there could be an issue. For my peace of mind, she ordered an ultrasound and all came back clear – whew. 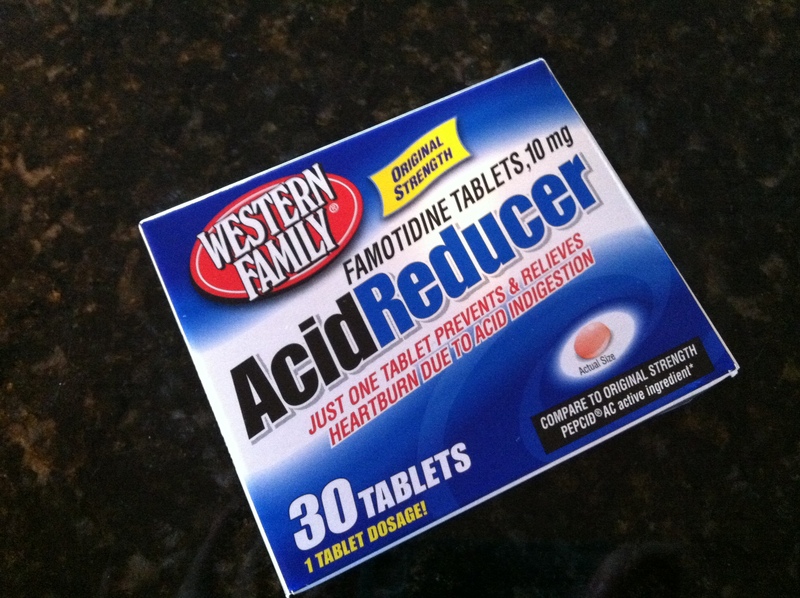 She told me to take some acid reducer when I felt sick and that was that. On my merry way I went. Or, more like on my merry drinking way I went. I’m sure you can guess the rest of the story. Despite taking tons of antacids and acid reducer, I continued to have stomach problems. It didn’t matter what I drank or when I drank, nothing changed. And, then, through a serious of events I quit drinking and got sober. And, guess what? My stomach problems went away – completely. You don’t have to be a genius to put two and two together. And so, as I stood in the kitchen this morning feeling grumpy and irritated, I was snapped back into reality by this innocent box of acid reducer that had been hiding in the back of the cabinet for nearly two years. Sometimes it’s the uneventful and unexpected things like this that remind me just how truly far I’ve come. And, how God continues to do His work in both big and small ways. Sounds like you had a positive experience, which is such a great way of looking at it! I will still have an experience now and again like the one you just described, and I still have that pang of remorse. But the great news is that I can read blogs like yours and remind myself of the positive way I can approach the situation, so thanks for sharing! Well said, Chenoa. We are given these little road markers and land marks that show us where we have been and where we are now. We can see the trail of breadcrumbs, and it’s helpful when we feel that we are stuck or going nowhere. I too get these little things that at first might give me a cringe or a smudge across my emotions, but then I see where I am now and I have to believe that I was meant to be where I am, and I was also meant to be in the pain I was then. Congrats on your new sobriety! Amazing how everything starts making sense once we have a clear mind and some perspective. I’m wishing you the best!